I had pinned this picture onto my Crafts and DIY Projects board a long time ago. I decided I would give it a try, only to find out that the pin didn’t go anywhere. Not wanting to give up on the idea, I decided to just give it a try. 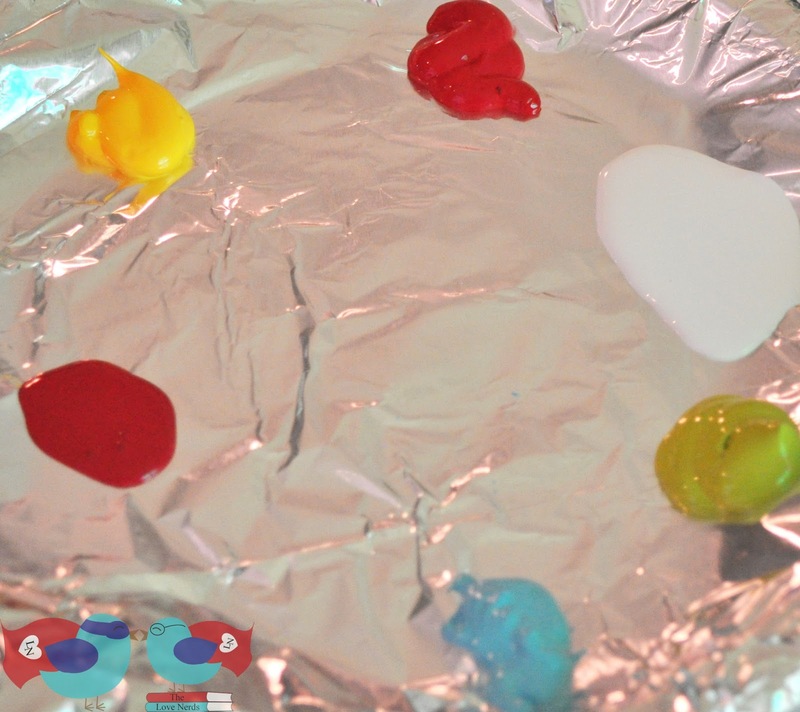 I chose 5 different enamel paint colors – a red, blue, green, white, and yellow (these colors also match the dishes from my kitchen). I grabbed a few Pyrex bowls that came in a box set of other items; I haven’t used them because we have a whole set of glass bowls, so I thought these would be great to upcyle into something pretty. I used a short but slightly thick paint brush to paint the dots. 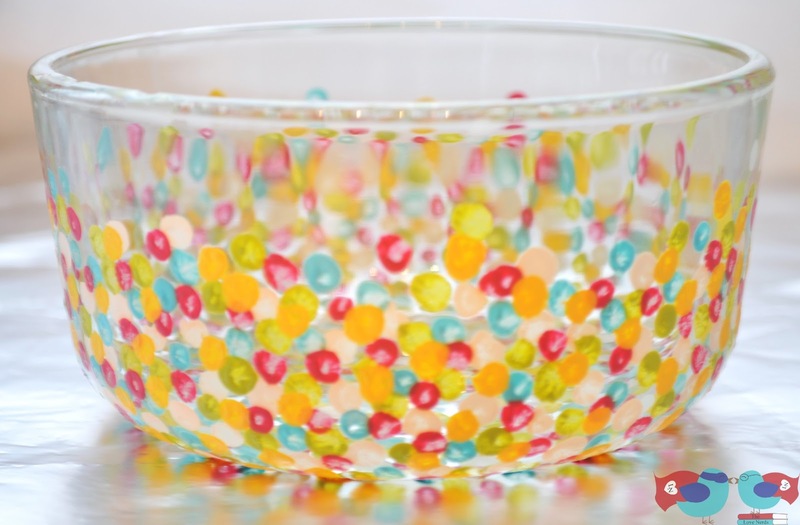 I have seen online that people also use pencil erases to also paint dots, so that it also worth a try. 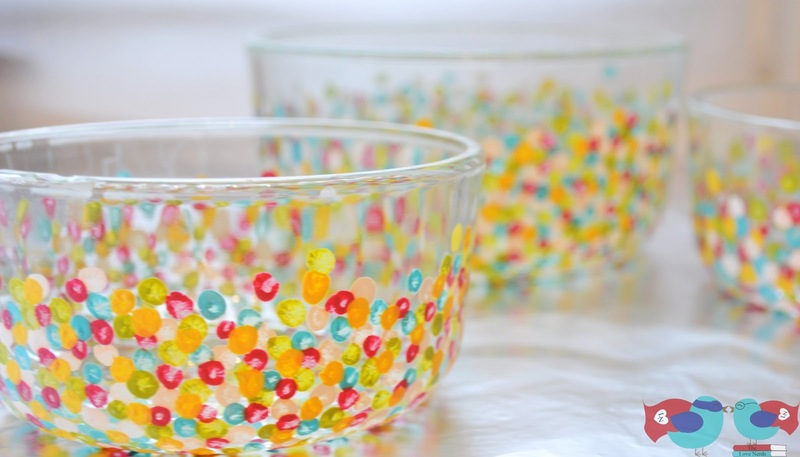 Choose one color to start with and begin painting the dots on the outside of the dish. Let it dry, and move on to the next color. The great thing about this project is you can easily modify the look of the project based on the thickness of the dots and colors. The options are endless. I actually used this same technique for a different project this weekend, but they are a gift so I can’t share with you all for a little while longer. Once you are satisfied with the look, let it dry for 30 minutes. Put them on a layer of parchment paper on a cookie sheet or another pan. 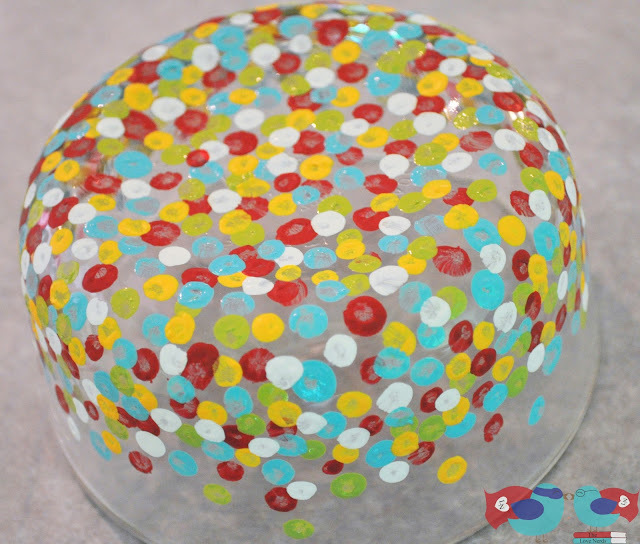 Place in a cold oven (glass needs to gradually warm up) and turn to 350. After 30 minutes, turn the oven off but I suggest leaving the project in there awhile to slowly start cooling down. I would recommend only hand washing these in the future to help them last as long as possible. How fun are these?! I’m terrible about doing crafts, but this looks like something i could handle. such a cute idea!! so simple and fun!! I LOVE it! Thanks, Cheryl! I am so glad you stopped by and liked the project. Such a simple update yet it makes such a difference. Great job! Thanks for sharing! Thanks, Angela! 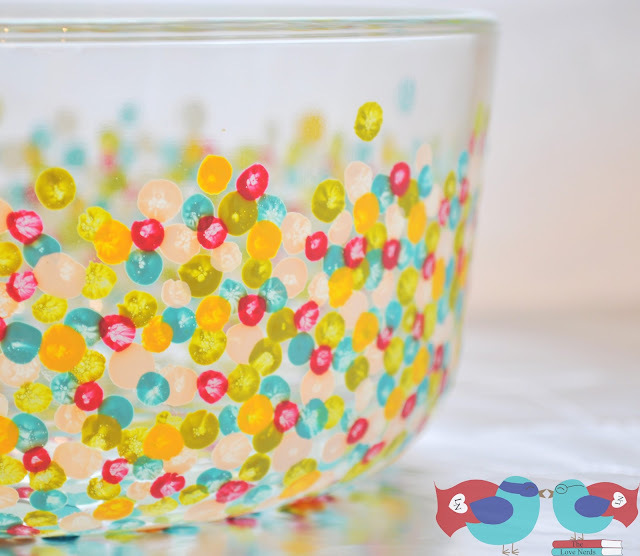 I am using this technique on cheap stemless wine glasses and a serving bowl as well. I can’t wait to share how that version turns out as well. Thanks again, Sarah, for featuring! So cute. I’ve been seeing it on pinterest too. The paint brush adds a nice texture in each paint dot. Coming over from Spring Hop party. Thanks, Anjana! I love the texture too vs. the flat dots. I did the same technique with red and pink on stemless wine glasses and they turned out really cool. 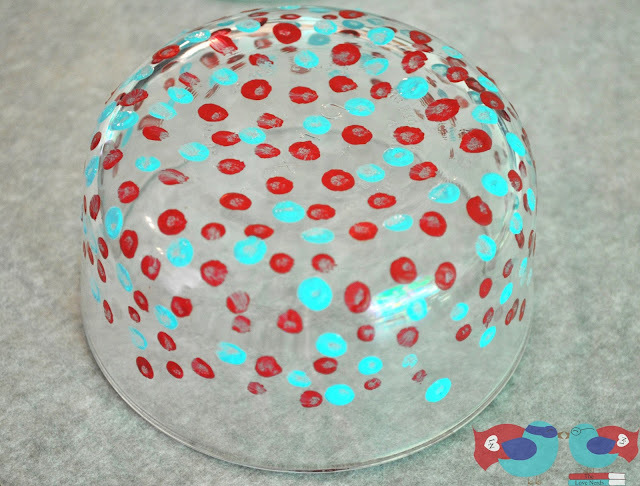 Thanks for stopping by allthingswithpurpose.com with your hand dotted glass bowl!! We look forward to seeing what else you create next Thursday’s Link Up!! Check back on Sunday to see if you’ve been featured! Thanks, Andrea! They make a great gift, especially since they look nice for being a perfect Dollar Store Project. Fantastic! I love how these came out! Thanks for sharing at Silver Pennies Sundays! Thanks, Danielle! I can’t wait to show another version next week as an update. They were made as a gift, so I’ve had to keep them secret through this weekend. Thanks, Kayla! I am glad you like them. And thanks for stopping by my blog. These are beautiful. Looks like something from Anthro! Thanks for linking this up to Monday Funday! Thank you, Kelly! What a wonderfully nice compliment! Thanks, Diana! Thanks for stopping by my blog as well. These are super cute – I love the finished look. I think my kids would love to make these – maybe even finger prints for grandmothers. Thanks for sharing! Thanks, Elizabeth! What a wonderful idea. I would love it if you shared your kids’ version if you if decide to let them try it out.